Visit GetSIME.com today. You'll find it on the worldwide web. 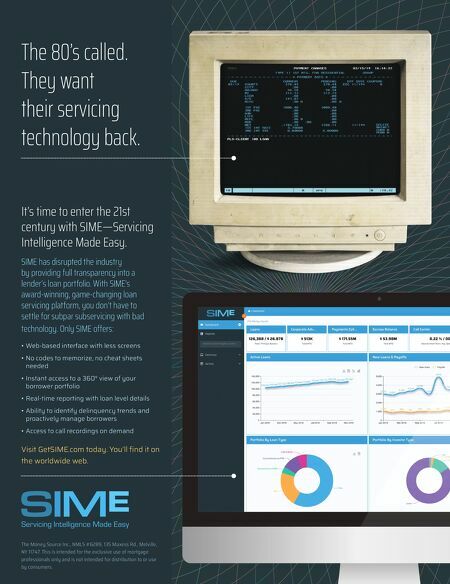 It's time to enter the 21st century with SIME—Servicing Intelligence Made Easy. SIME has disrupted the industry by providing full transparency into a lender's loan portfolio. With SIME's award-winning, game-changing loan servicing platform, you don't have to settle for subpar subservicing with bad technology. Only SIME offers: • Web-based interface with less screens • No codes to memorize, no cheat sheets needed • Instant access to a 360° view of your borrower portfolio • Real-time reporting with loan level details • Ability to identify delinquency trends and proactively manage borrowers • Access to call recordings on demand The Money Source Inc., NMLS #6289, 135 Maxess Rd., Melville, NY 11747. This is intended for the exclusive use of mortgage professionals only and is not intended for distribution to or use by consumers. The 80's called. They want their servicing technology back.